A mask of a satyr, a male companion of ancient wine god Dionysus with horse-like features, has been discovered by archaeologists near the town of Vetren in Southern Bulgaria during the 2015 summer excavations of Pistiros, an Ancient Greek emporium, i.e. a trading post, inside what once was the Ancient Thracian Odrysian Kingdom. An emporium (in Latin; “emporion" in Greek) was a settlement reserved as a trading post, usually for the Ancient Greeks, on the territory of another ancient nation, in this case the Ancient Thracian Odrysian Kingdom (5th century BC – 1st century AD), the most powerful Thracian state. Pistiros was set up as an emporium by Ancient Greek merchants from the Aegean Island of Thasos in the 5th century BC, and saw its height in the 4th century BC under the protection of the Thracian Odrysian Kings. It was destroyed in 279-278 BC by the Celts, and never recovered as an emporium; an Ancient Thracian metallurgical settlement was built there in its stead. The ruins of emporium Pistiros were discovered in 1988 by Polish-Bulgarian archaeologist Mieczyslaw Domaradzki. 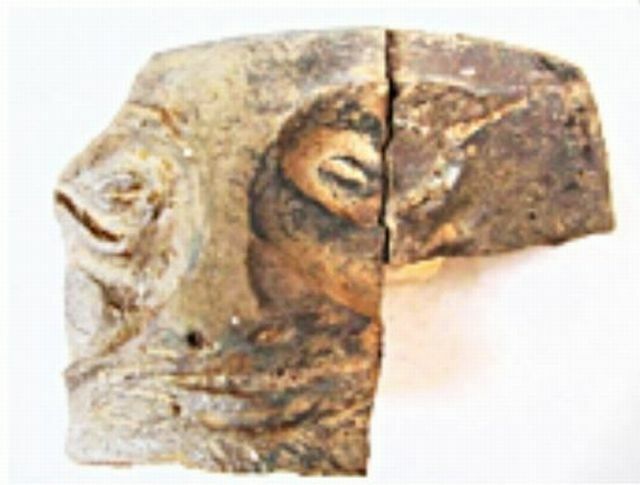 The satyr mask from emporium Pistiros has been found on a fragment from a ceramic vessel, reports local news site Kmeta. It has been discovered by archaeologist Gavrail Lazov from Bulgaria’s National Museum of History in Sofia. 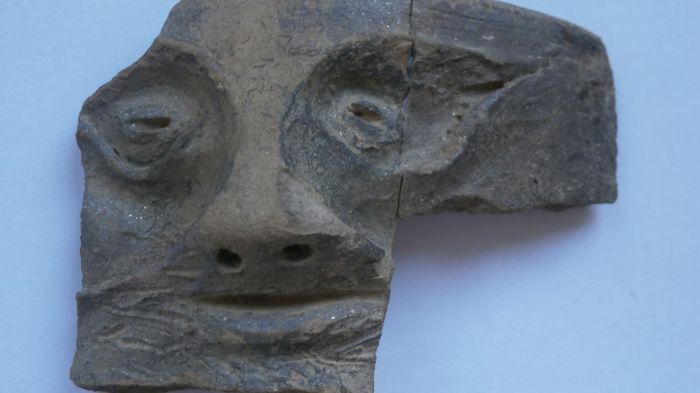 “This find is unique for Bulgaria," says Valentina Taneva, Director of the Mieczyslaw Domaradzki Museum of Archaeology, also known as the Septemvri Museum of Archaeology, in the southern Bulgarian town of Septemvri, who is also among the participants in the digs. The satyr mask relief was in fact situated high at the mouth of the ceramic vessel, on its outer side. It clearly depicts a human face with a nose and a mouth. The 2015 digs at the Ancient Greek emporium Pistiros in the Odrysian Kingdom of the Ancient Thracians have yielded a number of other intriguing finds as well, in addition to the mask of the satyr, the mythical companion of wine god Dionysus. One of them is a bronze application of a horse ammunition depicting a griffin head which is dated to the end of the 5th century BC. Other artifacts discovered by the archaeologists near the town of Vetren, Septemvri Municipality, Pazardzhik District, include silver and bronze coins, a ring, fibulas, and loom weights. The archaeologists have also found Ancient Greek ceramics with various images, reports the local daily Zname. Lead archaeologist Aleksey Gotsev and his colleague Vyara Petrova have excavated archaeological structures containing evidence of three time periods in the history of the Ancient Greek emporium in the Odrysian Kingdom of the Ancient Thracians. They are yet to fully explain the different stages of the development of the ancient city near Bulgaria’s Vetren. The upper-most archaeological layer contains remains of stone structures from the 4th century BC. The archaeologists have come across a two-meter deep pit containing broken tiles which they have extracted in order to examine them. The 2015 summer archaeological excavations have marked the 27th archaeological season since the discovery of emporium Pistiros back in 1988, an untypical Ancient Greek trading post because of its location so deep into the territory of the Ancient Thracian Odrysian Kingdom. The 2015 digs have been carried out with modest funding. Bulgaria’s Ministry of Culture has provided no money whatsoever for this year’s excavations of the emporium near Vetren. The digs have been fully funded by Septemvri Municipality, and by the Balkan Heritage Foundation, a NGO. Lead archaeologist Assoc. Prof. Alexey Gotsev from the National Institute and Museum of Archaeology of the Bulgarian Academy of Sciences has expressed his indignation over the fact that the Bulgarian government has provided no funding for the 2015 excavations. Against this backdrop, a total of 38 ancient artifacts from emporium Pistiros were included in Bulgaria’s recent exhibition on Ancient Thrace in the Louvre Museum in Paris. The 2015 excavations of Pistiros has been conducted by Bulgarian archaeologists only even though in recent years they have been aided by scholars and students from the Charles University in Prague, the Czech Republic, and from the University of Liverpool in the UK. The British and Czech archaeologists are expected to rejoin their Bulgarian colleagues in the exploration of emporium Pistiros for a new five-year period starting in 2016. The history of the Ancient Greek emporium Pistiros in the Ancient Thracian Odrysian Kingdom (5th century BC – 1st century AD), the most powerful Thracian state, began in the 5th century BC. An emporium (in Latin; “emporion" in Greek) was a settlement reserved as a trading post, usually for the Ancient Greeks, on the territory of another ancient nation. The ruins of the Ancient Greek emporium Pistiros are located on the outskirts of today’s southern Bulgarian town of Vetren, Septemvri Municipality, Pazardzhik District, on the left bank of the Maritsa River. (At the time, the Maritsa River was navigable for smaller boats, and Pistiros probably had a river port.) Pistiros was a trading post set up by Ancient Greek traders deep inside the territory of the Ancient Thracians. Emporium Pistiros was founded in the second half of the 5th century BC, in the first years of the Thracian Odrysian Kingdom, possibly during the reign of King Teres I (r. 460-448 BC) or his sons, King Sparatocos (r. 448-431 BC), and King Sitacles (r. 431-424 BC). In the 4th century BC, and especially during the reign of Odrysian Kings Amadocus I (r. ca. 410 BC – ca. 390 BC), and Cotys I (r. 383 BC – 359 BC), emporium Pistiros saw its height. In the early 3rd century BC, however, more specifically in 279-278 BC, it was destroyed by the Celts and never recovered as an emporium. Instead, it was resettled by Thracians and became a center of metallurgy for the exports of metals from Thrace into Ancient Greece, as testified by the discovery of metallurgical tools; the new Thracian settlement replacing the Greek emporium produced iron, bronze, and silver decorations such as fibulas, among others. Pistiros was unique, first of all, because of its location. It is the only Ancient Greek emporium found to be located so deep inland while in their trade and search for resources the Ancient Greeks usually preferred to establish colonies on the coast in order to be able to retreat in case of hostilities from the local tribes. It is also unique because it had a settlement system quite different from what was typical of Ancient Thrace: it had a fortress wall with massive foundations, gates protected by towers and bastions, paved streets and water supply and sewerage system with underground pipelines. The ruins of emporium Pistiros were discovered in 1988 by Polish-Bulgarian archaeologist Mieczyslaw Domaradzki (even though some scholars dispute the discovered ruins belong to Pistiros and claim they belong to an unidentified ancient city) near the town of Vetren, Septemvri Municipality, in Southern Bulgaria. The name of Pistiros became known thanks to the 1990 discovery of an inscription in Ancient Greek read by Prof. Velizar Velkov and Dr. Lidiya Domaradzka making it clear that the emporium was founded by Ancient Greek merchants from the Island of Thasos. According to the so called Vetren Inscription, by the time of the reign of Odrysian King Cotys I (r. 383 BC – 359 BC), the merchants from Thasos as well as the Ancient Greek colonies of Apollonia Pontica (today’s Bulgarian Black Sea town of Sozopol) and the polis of Maroneia on the Mediterranean were enjoying the special protection of the Odrysian dynasty to trade with the Thracians at emporium Pistiros. The Vetren inscription is the oldest known inscription in Ancient Greek found on the territory of Ancient Thrace; it testifies to the close ties between the Thracian Odrysian Kings and the Greek merchants at the time. It makes it clear that the city had autonomy within the Odrysian Kingdom, the King did not interfere in its affairs, and its residents were freed from duties and levies but had to pay taxes to the Odrysians. Archaeological excavations at Pistiros have revealed the eastern fortress wall with its gate, fortress towers, and a bastion made up of huge stone blocks similar to the Ancient Greek fortifications on the island of Thasos as well as streets paved with stones and a well structured water supply and sewerage system. The excavated fortification system of emporium Pistiros was built of large rectangular granite blocks up to 1.4 x 1.8 meters in size; the width of the fortress wall reached about 2.1 meters. One of the gates was protected by an outer fortress tower, while another of the gates – by an inner fortress tower. The lands around emporium Pistiros were inhabited by the Ancient Thracian tribe Bessi who are known for their cult of god Dionysus. The importance of this cult is confirmed by the Vetren inscription in which the Odrysian King Cotys I and his heir took an oath in the name of Dionysus to protect Pistiros and the Greek merchants trading there. The archaeological excavations of the emporium have revealed clay altars and stone zoomorphic and clay anthropomorphic figurines, among other artifacts. The population of Pistiros consisted of both Greeks and Thracians as indicated by the gravestone names. The excavations have yielded a wide range of ceramic vessels with depictions of scenes from the everyday life, entertainment, games, and mythology. Some of the discovered amphorae were imported from the island of Thasos. More than 950 coins have been found in Pistiros including coins of the Thracian rulers Amatocus I, Cotys I, Amatocus II, Teres II, Seuthes III, and of the Greek city-states Thasos, Maroneia, Apollonia Pontica (Sozopol), Mesembria (Nessebar). One of the major finds is a treasure of 557 silver coins and 9 gold coins of King Philip II of Macedon, his son Alexander the Great, and their heir in Thrace Lysimachus (r. 306-281 BC).